One Twenty - when miracle gets applause! This is a guest post from a tango friend of mine (H.). Enjoy! It all started as a curiosity and it ended up like a nice experiment! I am a heavy tango “consumer” and watching tango related movies, performances is part of my daily routines. Amazing performance! But what happened at 01:20? Without diving too much into details I would say that I really liked the show. By the time I’ve reached the end of the performance, I became curious in a certain moment of the dance. Maybe you have already noticed it as well; there is a shy applause at 01:20. Why are people applauding at 01:20? While receiving the first answers, I became very curios to see what tango people think when they see a performance. Therefore I’ve decided to send the link and the question to even more tango-friends. I can tell you that some of them are already also very curios about the outcome of my inquiries. Here are the answers; before reading them I would suggest you to give your own answer as well; otherwise you might get influenced by what others had in mind. Some people were more busy than others, some were maybe in a hurry. Some gave concise answers and some gave more elaborated answers. No judgement. No names given. No particular order. Still, I took the liberty to organize them into two sets: answers given by followers and answers given by leaders. The article might seem a bit focused on technicalities. With or without them …keep walking and enjoy tango! Let’s give another round of applauses for Jorge Daniel Dispari y Maria Carmen la Turca. Carmencita Calderon dances Argentine Tango at 100! It is mainly due to repetition. The capability to repeat cyclically a sequence shows the mastery of the topic. Many of us, especially beginners, “fall” from step to step, most of the time choosing the next step in the need to compensate incomprehension with the partner. However, the capability to repeat the sequence without losing the connection shows great control. This can be generalized to many disciplines. Repeating a movement gives the audience the time to recognize the mastery, understand the difficulty, take a mental cognitive rest, and acknowledge the performers with an applause. Such manifestation of mastery is, in this case, enriched by the control of the symmetry. Musicality gives the final touch. The same happens around 2:40. 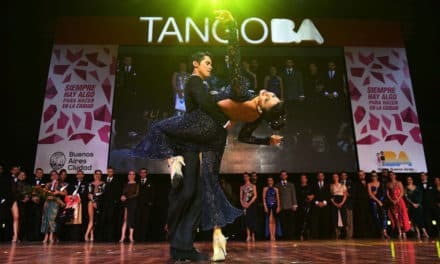 Leader opinion; and I agree with follower comment n. 9: “From what I generally saw at tango performances, after a set of repeating figures people starts to applaud; …”. Check it out yourself. No tango shoes but you want to dance? Get a pair of dance socks!